Marine ecosystems are renowned to be major repositories of environmental contaminants, such as heavy metals, persistent organic pollutants and plastic debris. Seabirds are often long-lived meso to top predators, hence particularly at risk of environmental contaminant bioaccumulation and biomagnification. They have therefore been widely used as sentinels in order to monitor the pollution in the ocean. Nevertheless, mercury (Hg) and plastic exposure of petrel species are still poorly documented, especially in remote areas such as polar regions. In the frame of my PhD, fieldwork is carried out during early and late breeding season, at different sites in Antarctic (King George Island, Adélie Land) and Subantarctic (Diego Ramirez Islands, Kerguelen Island, Falkland Islands) zones. Mercury, stable isotopes and compound specific stable isotopes will be measured from the same birds using feathers and blood samples. The presence of common plasticizers will be determined in the waxy preen oil using a recently established GC-MS protocol. 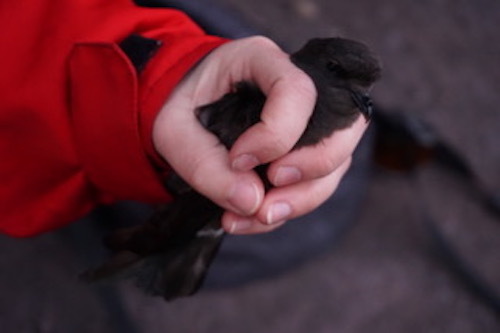 Additionally, plastic exposure of seabirds breeding in the Southern Ocean will be compared with storm petrel breeding in the North-east Pacific (Coronado and Todos Santos Islands, Mexico), an area renowned to display a high plastic contamination. Does the distribution at sea and the trophic level determine the level of Hg and plastic contamination in Antarctic and Subantarctic petrel species? Does the level of contamination change over the breeding period? Is there a carry-over effect from the winter areas? Are the Hg and plastic debris residues body burdens of petrel species breeding in Antarctic and Subantarctic zones lower than those breeding in the Northern Pacific? Are the levels of contamination hazardous for the birds? Is there a temporal variation in the exposure of Antarctic seabirds to Hg? Is there a synergetic effect of Hg and plastics? is highest in the North Pacific, intermediate in the Subantarctic and lowest in the Antarctic species.